Each Australia Day, there is a fun run through Dromana from Safety Beach to Rosebud on the foreshores of Port Phillip Bay. Here, runners are passing Dromana pier in the early hours of the morning. Mist swirling round the old council chambers in Dromana with Arthurs Seat mountain in the background. NOTE: Tchaikovsky's 1812 Overture features booming cannons at the close. The sound always reminds me of thunder in storms. I tried to embed an example but it simply wouldn't post! NOTE: Today is ANZAC Day - 25th April - when Australian and New Zealand forces first faced action in World War I. 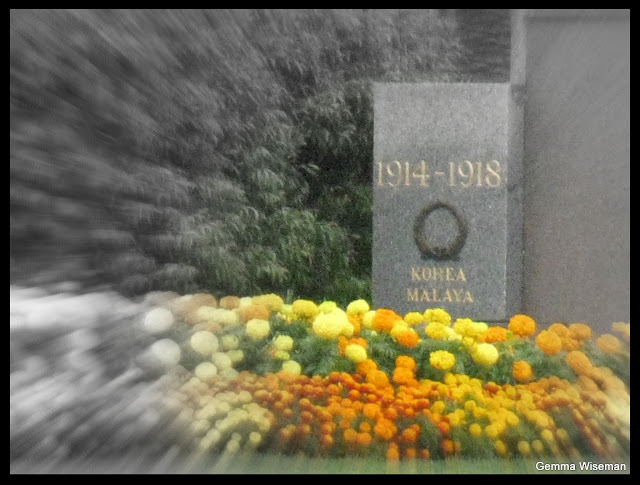 The image captures part of a memorial in a Dromana park - and the gold flowers always bloom at this time - in Autumn. HAPPY BIRTHDAY WILLIAM FOR 23rd APRIL! NOTE: I was thinking of two concepts. The Yellow Wasps were a paramilitary group active in the Bosnian War in the 1990's. The Honeybees are an acapella gospel group based in Sydney. Different But Not Too Fancy! This headstone appears at Mornington Cemetery. (His father worked at J.C.Williamsons' theatre productions, so he was away from home a great deal, but home enough for John to be fascinated with his world. On John's return to Australia, he concentrated on writing music for ballet and for small forces. In 1995 he was the Composer-of Honour in the Department of Music of Monash University. Anna Pavlova, the ballerina, filmed some of her dancing in the gardens of Grosvenor - the Tallis family's two storey Italianate mansion on the corner of Glenferrie and Toorak Roads. The Tallis family's holiday home was Beleura at Mornington - (Dame Nellie Melba stayed here as a guest!) now open to the public, but no parking is allowed there. A special meeting point is arranged (at the Mornington Regional Art Gallery) and a Beleura bus transports visitors from the meeting point to the site. Mr. Straub, the horologist, came over from Camberwell once a week to wind the many clocks in the house. Wonderful details of John Tallis' amazing life - written by John Tallis - are HERE! The Age presents a fascinating insight into the reclusive, bachelor later lifestyle of John Tallis.